In 1979, Ayatollah Khomeini instituted International Jerusalem Day in Iran as a show of support for the Palestinians and the “liberation of Jerusalem.” Today, this tradition still continues. What lies behind Iran’s support of “Palestine”? This year, fewer people attended the Jerusalem Day marches in Iran than ever before. Many showed their disgust at Iran investing its support in the Palestinian cause rather than taking care of its own dissatisfied, impoverished population. Iranian government figures attempted on social media to make it appear as if the march was a success, but other social media posts tell a different story. 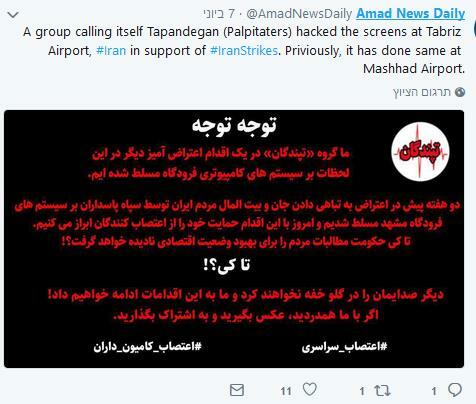 Hackers in Iran become more daring, even interrupting a live government broadcast with songs by an exiled Iranian woman singer and posting subversive messages on airport signs. Every year on the last Friday of the month of Ramadan, “World Jerusalem Day” (or Al-Quds Day) marches take place in Iran and also abroad (mainly in Shiite concentrations, but also in some European capitals). This day has been celebrated every year since 1979 following a decision by the revolutionary leader Ayatollah Khomeini. On this day, the Iranian government expresses the desire of all Muslims to “liberate Jerusalem.” Khomeini’s doctrine continues to prevail, defining and shaping the goals of the revolution even today and the proper way to strive toward their realization. This includes preserving hostility and a fundamental hatred of Israel and calls for its destruction. Al-Quds Day was commemorated this year on Friday, June 8, 2018. Behind Iran’s support of “Palestine” lies various ideological motives and strategies. “Palestine” (like Syria and Lebanon) is one of the centerpieces of Iran’s national security doctrine. From Iran’s perspective, the Palestinian armed struggle, or “resistance,” is Iran’s first line of defense. This is where Iran’s support for Palestinian Islamic Jihad (PIJ), Hamas, and other terror groups emanates, including supplying arms, training, and constant funding. Iran’s doctrine is that if it doesn’t do battle against Israel via its proxies (and also from Syria, using Iranian forces and Shiite militias), it will eventually have to deal with Israel on its own territory. However, this year, despite efforts by the regime to recruit and mobilize participants, the demonstrations were extremely sparse – maybe the sparsest they have ever been in the past 40 years. There was a small number of participants, and the organization, unlike in the past, seemed particularly amateurish. In any case, this year’s “International Jerusalem Day” took place under the slogans, “Support for Palestine, honor for Iran,” “Victory for the Palestinian resistance movement,” and “Down with American conspiracies” – following the transfer of the U.S. embassy to Jerusalem. Cleric with a domestic agenda. On social media, several calls of “Death to the leader” could be heard in the background of clips of the marches.3 Social media networks in Iran showed several videos with a slight difference among some of the participants in the marches. One clip, which went viral, showed a young cleric wearing religious garb, holding a sign asking, “Will the day come when we demonstrate for our homeland, Iran, and our nation, which is suffering, and not for others?” He shows the sign to passersby (who were brought to the demonstration against Israel), and they can be heard blessing, praising, and endorsing him.4 Opponents of the regime put up hashtags in a similar spirit: “#NototheIslamicRepublic,” “#Notoal-QudsDay,” attaching them to the video of the demonstrating cleric.5 Additionally, they also put up hashtags such as “#NoGazaNoLebanonLiveforIran.” (#نه_غزه_نه_لبنان_جانم_فدای_ایران), as well as IranRegimeChange #IRGCTerrorists#. The Iranian press, which supports the president, explained that he did not participate in the Jerusalem Day demonstrations because he was on his way to China to participate in a conference of the Shanghai Cooperation Organization (SCO), during which he met with the presidents of Russia and China. As his words were broadcast on Radio Tehran, they were suddenly cut short by a brief audio clip of a song by the famous Iranian woman singer Googoosh (the stage name of Faegheh Atashin) who was popular in Iran before the Revolution, “I have arrived.” The broadcast was cut off and then resumed afterward with Larijani’s speech.10 Googoosh left Iran in 2000 due to harsh restrictions imposed on women singing after the Revolution. In the end, Iran marked Jerusalem Day in the shadows of an internal crisis that has hit the country and growing domestic protests at the same time as renewed U.S. sanctions. The masses did not fill the Iranian squares to march on al-Quds day. International Jerusalem Day only sharpened the internal disputes in Iran and brought to the surface the disputes about the regime’s problematic set of priorities – its preference to handle distant crises at the expense of the Iranian people. On June 14, 2018, the World Cup opens in Moscow, Russia. Soccer is like a second religion in Iran, and the Iranian team has been placed, by the luck of the draw, into the “death group B” of Spain, Portugal, and Morocco teams. It will grab considerable public attention over the next few weeks, or at least while the Iranian team is still playing. Protests against the government are also forecast to be seen during the Iranian team’s matches, carried out by many Iranian exiles who are expected in Russia. The local Iranians themselves have no money to travel to Moscow due to soaring dollar rates. The Iranian regime puts Jerusalem at the top of its priorities, but the Iranian people are only interested in its growing economic crisis and their inability to watch its team play up close.